The singer says he has contacted Metallica, the Foo Fighters and others about taking part in a massive New York City-area concert. 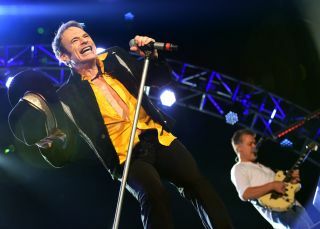 Van Halen have been inactive since completing their 2015 reunion tour, but frontman David Lee Roth reemerged on the public stage this past week, giving characteristically wild and entertaining interviews about his new tattoo skin care line, Ink the Original. His latest interview is with New York magazine’s Vulture.com, and in it, Roth drops a few nuggets about upcoming plans—big plans, as he tells it—in the Van Halen camp. It remains to be seen whether or not this big-name mega-blowout bill will come to pass at Yankee Stadium. But consider this fair warning.